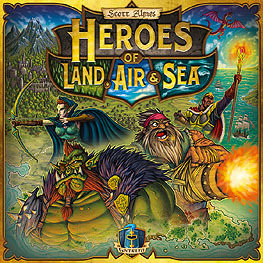 Heroes of Land, Air & Sea is a 4X-style board game that tells the epic tale of Aughmoore's many conflicts: Orcs vs. Humans, Dwarves vs. Elves, battling kingdoms, and the heroic individuals who turn the tides of war. Players control one of these four Factions, competing to expand their small kingdom of a single Warrior and two Serfs into new territory. From there, players must explore the territory around them, expand their work force, fortify their army, and build up their Capital city - all through careful action selection, exploitation, war and resource management. As players reach milestones through building, recruiting, or war, they gain access to many advantages and Victory Points. Achieving one of four "Objectives" will end the game: eXplore, eXpand, eXploit, or eXterminate.